These tiny little bites of biscuit heaven are perfect at your next brunch, or other buffet table. I promise you that your guests will keep coming back for more! I love that you can make these ahead of time either ready to bake or already baked. Then the day of the party you can easily bake them or warm them up and they are ready to serve! I found the recipe on Pinterest and tracked the recipe to here. 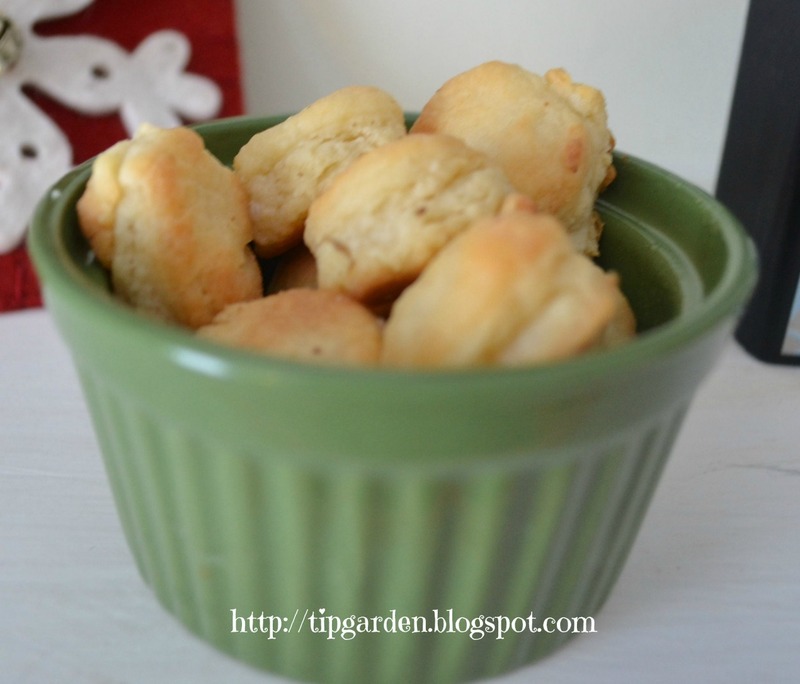 The recipe calls them Senator Hollings Flaky Appetizer Biscuits. Jan's Tip: The recipe called for using a 1- 1 1/2 inch biscuit cutter. I assume your average cook doesn't have a small biscuit cutter that size, so I tried a few things out instead. First I tried a water bottle cap, the problem was that my dough was thicker than the cap and the cap would squish them down too much making them less fluffy. (Plus I needed a toothpick to pry them out of the cap) SOOOO I cut the opening of the empty water bottle off and used the mouth of the bottle. It was perfect. It had an opening at both ends so it didn't squish the biscuits. I dipped the cap in flour to keep the dough from sticking . I just gently popped them out with a toothpick if they stuck. 2-3 tablespoons melted butter for brushing on the hot baked biscuits. Turn the dough out onto waxed paper and divide into two balls. Jan's Tip: I really found the dough to be just too darned sticky to work with here, so I ended up mixing in the other 1/3 cup flour into the dough by hand on the waxed paper (I used a recyled cereal bag liner) before proceeding with next step. I used extra flour (instead of the 1/3 cup as called for) in the rolling out of the dough in the steps that follow. flatten each of the two balls of dough, wrap each in waxed paper or plastic wrap and refrigerate 30 minutes. at the 30 minute mark remove dough from refrigerator. Lightly sprinkle a board or counter top with some of the 1/3 cups reserved flour Sprinkle the top of one of the first portion of dough with flour. with a floured rolling pin, roll out to about 1/4 inch thick. For each biscuit dip biscuit cutter into reserved flour and cut out biscuits starting at the outside edge adn working your way around and to the middle. If you plan on baking the biscuits now preheat the oven to 425 degrees. Remove biscuits to an ungreased baking sheet (You may need a metal spatula to help with this). Place biscuits 1 inch apart. 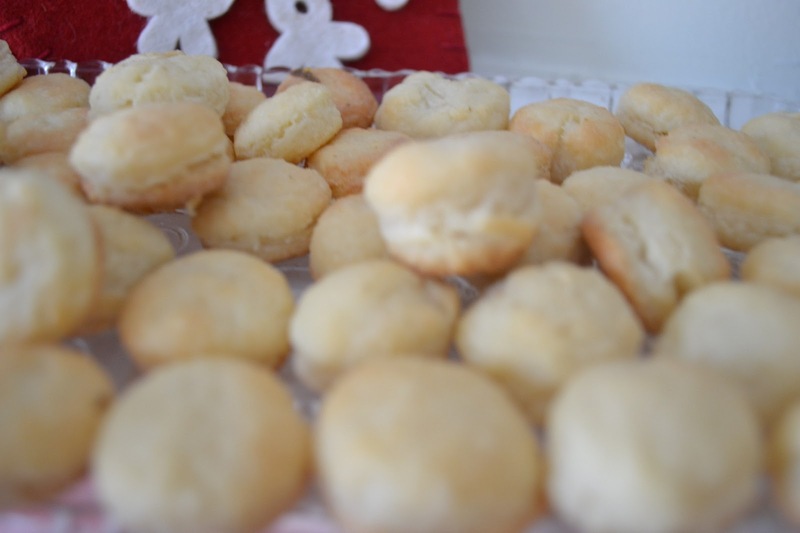 Refrigerate pan of biscuits 10-20 minutes until cold. Bake biscuits on the top rack of the oven for 10-12 minutes till golden brown.